NWI NEXP602 Northwest Rotary Laser Level Transfers points from floor to ceiling as well as leveling and slope matching. Complete with detector, tripod, and 9ft rod. Ideal for foundations, decks, drop ceilings, cabinet installation, tiling and framing and dual beam squaring for both level and plummet. 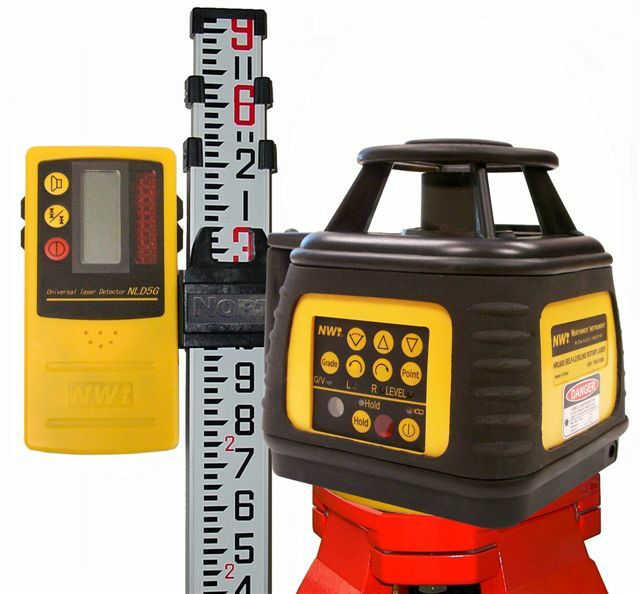 NWI NEXP602 Northwest Rotary Laser Level Kit with Tripod and 9ft Rod It is an ideal tool for transferring vertical points, leveling, alignment and squaring. The NRL602 rotary laser is ideal for use in applications such as foundations, decks, drop ceilings, cabinet installation, tiling and framing. Indoor features include wide sweep, narrow sweep and dual beam squaring for both level and plummet. Specifications: Laser Beam: Horizontal, Wave Length: 635 nm, Rotating Speed: 600 rpm, Operating Range: 2,000 ft with Detector, Leveling Accuracy: 1/16 in @ 100 ft horizontal, 1/8 in @ 100 ft vertical Self Leveling Range: +/- 5º Self Leveling Method: Electronic Servo Motors Bumper Sensor: On Board Power: Rechargeable Batteries, Tripod Adaptor: 5 / 8 x 11 thread Includes: Rotary Laser, Remote Control, detector and Bracket, Rechargeable Batteries & Charger, Carrying Case, Tripod, 9ft level rod, & Manual. Has a Visible beam for interior work. THREE YEAR MANUFACTURER WARRANTY. We supply Northwest Instrument Co. rotating laser levels. These combine electronic compensation, servo automation and optical-electronic sensing. Other products include automatic levels, rotating lasers, theodolites, total stations and much more.